Aimee Phan is one of a group of Vietnamese American writers whose recent work has grappled with the complex legacy of Paris as a site crucial to the Vietnamese diaspora and its imaginary. In his presentation, Karl Ashoka Britto will discuss Phans The Reeducation of Cherry Truong, a novel that tells the story of a Vietnamese refugee family split between the United States and France. He will consider in particular the ways in which Paris functions within Phans work both as a material presenceas the city in which the Truong branch of the title characters family attempts to take root in exileand as a floating signifier within the diasporic imagination. 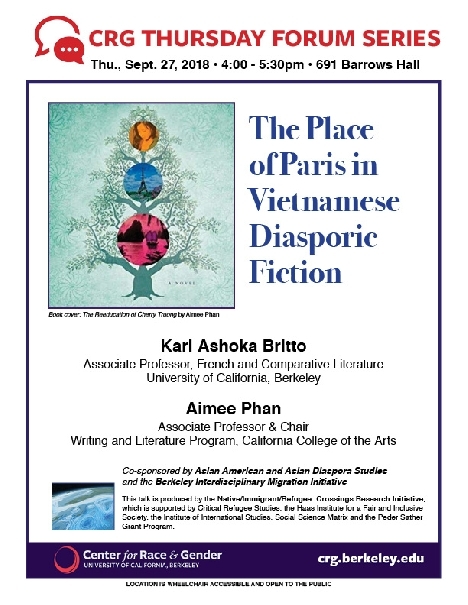 Whether in the title of the Paris by Night videos watched by the young Cherry and her cousins in California, or in the letters of Grandfather Truongwritten from Paris but still filled with longing for the city of which he dreamt as a student in colonial VietnamParis emerges in Phans novel as a central point of reference for the articulation of Vietnamese diasporic identity. Britto will be joined by Aimee Phan, who will read from her novel and discuss the sources of inspiration that led to its writing. Karl Ashoka Britto is Associate Professor of French and Comparative Literature at the University of California, Berkeley. He is the author of Disorientation: France, Vietnam, and the Ambivalence of Interculturality, and is currently working on a project that considers the ways in which certain bodies, including those of the colonized soldier and the métis, trouble colonial systems of signification. Among other topics, he has published on memory in Vietnamese American literature and on colonial anxieties in early zombie movies. As a contributor to the online journal Public Books, he has written essays on a number of francophone and anglophone writers of the Vietnamese diaspora, including Aimee Phan, Kim Thúy, and Viet Thanh Nguyen. Aimee Phan grew up in Orange County, California, and now teaches in the MFA Writing Program and Writing and Literature Program at California College of the Arts. A 2010 National Endowment of the Arts Creative Writing Fellow, Aimee received her MFA from the University of Iowa, where she won a Maytag Fellowship. Her first book, We Should Never Meet, was named a Notable Book by the Kiryama Prize in fiction and a finalist for the 2005 Asian American Literary Awards. She has received fellowships from the Rockefeller Foundations Bellagio Center, MacDowell Arts Colony and Hedgebrook. Her writing has appeared in The New York Times, Salon, USA Today, and Guernica, among others.